I am Genoveva von Lubeck and my creative soul resides among these pages. I am a member of the Society (SCA), which is a non-profit educational organization seeking to recreate the Middle Ages and Renaissance. When I joined the Society, I explored many different time periods and cultures, but I was always drawn right back to 16th century Germany in nearly everything I did. In those German “artifacts” I researched and created, I began to explore my own German heritage, understanding how my ancestors would have viewed their world. And then I had an amazing discovery! While working on my wool goldwork gown, I went looking for actual artwork of persons living in Lubeck in the 16th century, as my ancestors hail from Lubeck, Germany. I discovered that one of the burgermeisters during this time period was named Christoph Tode. Tode is my family name on my mother’s side and is quite rare. While I cannot trace my ancestry directly to this person (his line died out with his daughter, who had no children), I still felt I had inadvertently discovered something important about MYSELF in this bit of history. 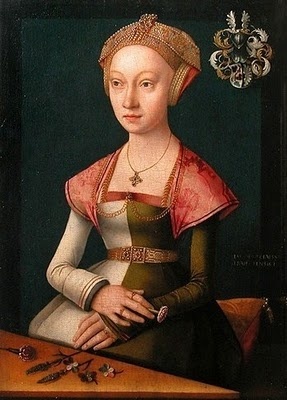 There is no doubt in my mind I am in some manner connected to this very real person who lived in 16th century Germany! From that point forward, my interest in 16th century Germany redoubled and I felt a clarity of purpose in my interest and research. 16th century Germans are remarkably complex and diverse, offering me a very deep well from which to learn. Learning about and creating items that may have existed in 16th century Germany has motivated me to new heights of creativity and bringing about a rebirth and renewal in my creative spirit. In a way, this is MY renaissance, too! I invite all manner of feedback, suggestions, and ideas. You can e-mail me at genoveva (dot) von [dot) lubeck [at] gmail (dot] com. My only request is that if you create something from one of my patterns or documentation, please drop me a line and show me a photo. I love meeting people who share my interests. I’m having trouble finding any other examples of this headdress. Do you have any idea what it would actually be called? Its not really a reticulated caul, but it isn’t a haube either….. I found your site exceptionally interesting. Thank you for all the research and work that went into some very detailed and informative articles. I couldn’t reply at the page for the German Starfish hat, Which is excellent, simple. Do you know of a pattern for a slightly more complicated version? Square top or whatever. I’m working on a Landsknecht outfit – still in planning stages. Many thanks – I just found your site – a treasure! I wrote a paper about the Luebeck in the 16th century in school about the rise of the rich buerger and their imitation of nobility – It went so far that they actually had a tournament for the Buerger sons and several family had coat of arms. I will see if I still have it… I also have a very lovely book about the burger houses in Lubbock and will see if there is something of the Tode family in there! ps: I just came back from my first CSA event here in Oregon and am utterly fascinated.